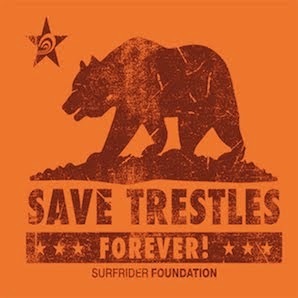 The fight to Save Trestles continues. Last month, the California Coastal Commission (CCC) voted to deny an application for the proposed Foothill-South toll road. The CCC overwhelmingly concluded the toll road is not compliant with several provisions of California coastal law. Thousands of Save Trestles supporters attended the meeting—making it a record setting hearing, and a watershed moment for the environmental movement. However, the Transportation Corridor Agency (TCA) has filed an appeal with the Secretary of Commerce requesting the CCC decision be overruled. The appeal process includes an opportunity for the public to request a local hearing in order for the Secretary to hear concerns of California residents. Please help us contact the Secretary of Commerce and ask him to grant a public hearing. We were able to sway the Coastal Commission when thousands of people attended the hearing—and now we need to show the Federal government how powerful our voices are together. Please tell the folks in Washington DC to come out to California and hear why so many people are opposed to the toll road. We need your help ensuring the Secretary of Commerce grants a public hearing so all of your concerns will be heard. More press today in the LA Times. I guess if anyone has the courage to fire Clint Eastwood it would be Arnold. He's been wrong on so many environmental decisions lately. You have to wonder who is giving him guidance these days? Eastwood ..."seemed perplexed because his opposition to the road predated by more than two years the governor's endorsement of it in January. He said that he told Schwarzenegger long ago of his reservations and that the governor urged him to follow his conscience." "You're not going to get people who are interested in state parks who want to build freeways through state parks," Eastwood said. "So I don't know what the big surprise was there." And Bobby Shriver led off the opposition to the toll road at last month's Coastal Commission Hearing. These guys are heroes for the coast!! Gov. Arnold Schwarzenegger either felt the need for “fresh legs” on the state Park & Recreation Commission or was in the mood for political payback. Whatever his true sentiments, his staff notified his brother-in-law Bobby Shriver and actor Clint Eastwood on Monday that they were no longer needed as state park commissioners. Shriver, 53, a Democrat and brother of First Lady Maria Shriver, and Eastwood, 77, a Republican and former mayor of Carmel, were first appointed to the advisory commission by Gov. Gray Davis in 2001. Three years later, Schwarzenegger reappointed both of them to four-year terms. On Tuesday, Shriver said he and Eastwood had submitted requests to serve another four-year term. Eastwood couldn't be reached for comment. As commissioners, the two men voted to oppose a 16-mile extension of state Route 241 that would connect southern Orange County to Interstate 5 at San Onofre. The toll road would cut across a nature reserve in Orange County and the San Onofre State Beach, a site considered sacred by American Indians and cherished by surfers and campers. Shriver and Eastwood also supported a lawsuit against the road project that was filed on behalf of the park commission by the state attorney general. Schwarzenegger publicly endorsed the toll road extension, saying it would reduce traffic congestion. The governor also said the project would allow the financially beleaguered state park department to take advantage of a $100 million grant offered by the Transportation Corridor Agencies in exchange for approval of the road. The toll road proposal hit a major roadblock in February, when the state Coastal Commission voted 8-2 against it during a hearing at the Del Mar Fairgrounds. The Transportation Corridor Agencies has appealed that decision to the U.S. Secretary of Commerce. Shriver, a city councilman for Santa Monica, felt so strongly about the toll road that he testified against it at the Coastal Commission meeting. State park commissioner Caryl Hart of Sebastopol, who last year was appointed to a third term on the panel, said she has little doubt that Schwarzenegger was displeased with his two most high-profile park commissioners. Schwarzenegger's press secretary, Aaron McClear, said the governor's decision to replace Shriver and Eastwood wasn't connected to their stand against the toll road. As expected today, the Federal Register printed the notice for the TCA's appeal of the CA Coastal Commission's decision. The CCC's jurisdiction is provided by the National Oceanic and Atmospheric Administration (NOAA), which resides in the US Dep't of Commerce. This means that the ultimate decision on whether to honor the CCC's decision or over-ride it lies with the Secretary of Commerce. Today's announcement tells us that NOAA will be accepting comments for 30 days starting on April 28. This will be your opportunity to let the federal government know what has been made clear here in California: No Toll Roads through San Onofre State Beach!! Starting on the 28th we'll provide an electronic action alert to make it easy for you to send in your comments. We are also requesting that NOAA hold a public hearing on this issue to give the public a chance to voice your opinions. "What does the Secretary consider on appeal from a state’s objection? · Necessary in the interest of national security. " The TCA has appealed the Coastal Commission's decision to the Federal Secretary of Commerce. Watch for your opportunity to weigh in to the DC folks next week. In the mean time, check out this cool video on MTV online.